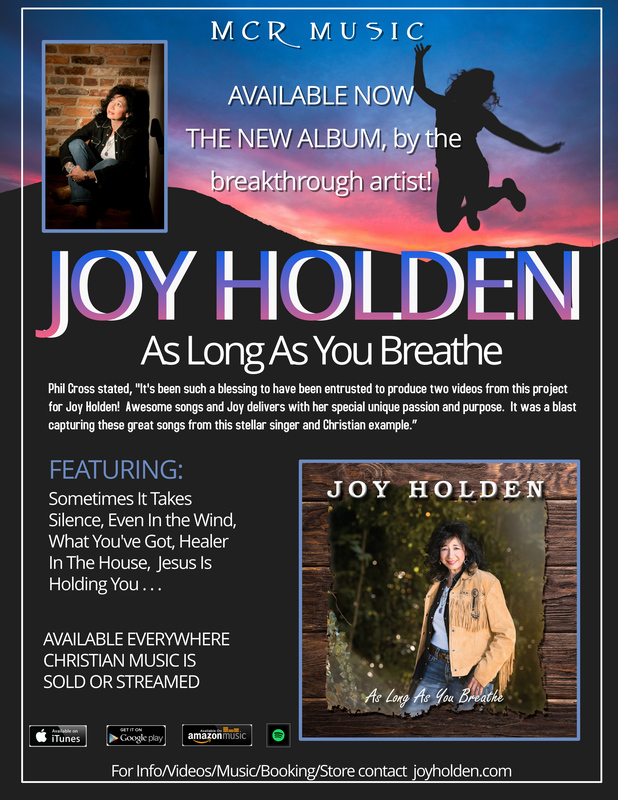 JOY HOLDEN is a Christian singer-songwriter and producer from Spartanburg, SC. She has a dynamic and powerful voice, and her live performance can be described as one preacher put it, a high energy anointing! Her great enthusiasm for JESUS is simply contagious! Joy’s musical style is unique, some may call it Southern Gospel while others call it Contemporary Christian. Either way, she calls it, "the music God gave me, I will play whatever HE calls me to do to bring people to Jesus.” As with any genre - the key to reaching people is an abundant list of great songs and she has those. Holden’s 12 song debut album, As Long As You Breathe, which was released to audiences in 2018 from MCR Music is garnering great reviews. Her team just released a new single to Christian radio, which Holden penned called “Under Water.” To share some audience favorites, she has new EP under way that will be released in mid-2019, which includes her favorite gospel songs! Jump for Joy! Find joy in the journey with JESUS! Joy Holden, seasoned veteran from Boiling Springs, SC, returns to music in the Christian Gospel ministry. Described by gospel enthusiasts as a fresh modern sound in Christian Contemporary music with roots in Southern Gospel, Holden’s vocal style is edgy yet pure, rich and soulful. Her music inspires through both song and story. As Holden reveals, “I believe God wants me to help the broken-hearted through music. I had a vision from God and new music was poured over me. It was a gift. A re-birth in me spiritually, physically and musically." Joy’s debut Christian Gospel album, As Long As You Breathe, was released by MCR Music in December 2017. This new album is a collection of anointed and personal songs, including a favorite one for Holden’s Dad, written the day after his funeral last April called Jesus is Holding You. The album unfolds much like a story, with chapters as songs … from the foot stomping, Healer in the House, to the bluesy Meet Me Right Where I Am, and soul-felt, What You’ve Got. These songs weave stories of testimony, redemption and recognition of God’s grace and immeasurable love. The mid-tempo contemporary, modern styled, I Can Do Better, As Long As You Breathe, This Soul Needs Your Grace and Take Me in Your Hand while great songs could easily be served up as Praise and Worship anthems. Other tracks, like Even in Wind and Under Water are gospel at its very core. The ballad, Sometimes It Takes Silence showcases Joy’s amazing lead vocals, along with Carry Me (about the poem “Footprints in the Sand”). These are uniquely fresh stories about the journey of following Jesus. You may recognize the tight-knit harmonies of the Ruppe Sisters, Valerie R. Medkiff and Heather R. Bennett on most of the tracks providing background vocals on this debut. Background: Joy has always written Christian music even when touring and recording as a Pop/Rock artist. Joy's 1992, debut album, Do You Believe, in the rock category earned much praise, airplay, and major label interest and she was signed to a worldwide distribution deal, with CMC International. Popular songs are Confidence, Still Our Own, Do You Believe, and Ain’t No Way. 2013 Pop/Rock Distribution Release of "This That & The Other Thing"
The Year of the LORD’s Favor 1 The Spirit of the Sovereign LORD is on me, because the LORD has anointed me to proclaim good news to the poor. He has sent me to bind up the brokenhearted, to proclaim freedom for the captives and release from darkness for the prisoners, 2 to proclaim the year of the LORD’s favor and the day of vengeance of our God, to comfort all who mourn, 3 and provide for those who grieve in Zion— to bestow on them a crown of beauty instead of ashes, the oil of joy instead of mourning, and a garment of praise instead of a spirit of despair. They will be called oaks of righteousness, a planting of the LORD for the display of his splendor.